Things are a little more leisurely around Chadds Ford. 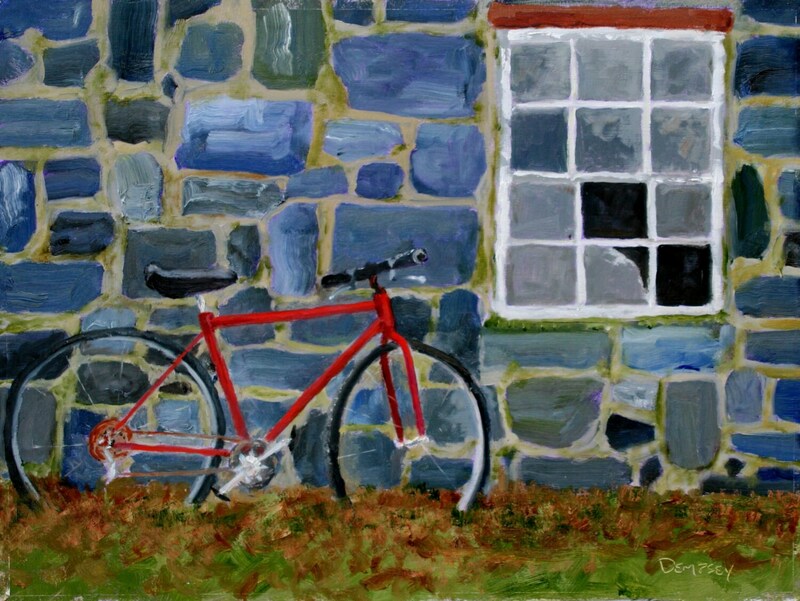 I found this bike leaning against an old barn wall at Haskell's Farm, an organic farm that supplies the famous SIW produce stand in Chadds Ford. SIW stands for "Stepped in what?!?" The building is very old, built from (I'm guessing) Wilmington Blue Rock. You can learn a bit more about that material in the listing for "Brandywine". I painted this during an event called Plein Air Brandywine Valley. The Haskells very kindly let us tramp all over their property. It's a place I always wanted to paint, so that was quite a treat. The painting is sixteen inches wide by twelve inches tall. It is an oil on a board. It was painted en plein air, on site.